I’ve always loved Doctor Who. I realize this statement, these days, does not make me unique or offbeat in any way, and I’m okay with that – thrilled, even. There’s plenty of Doctor Who to go around. I first discovered The Doctor when I was in middle school, on one of New York’s local t.v. channels, and I was hooked: I loved the guy with the long scarf and the jelly babies, and wanted to be the prehistoric chick who traveled through time with him. For those of you who have only lived in the modern Whovian era, her name was Leela. In seventh grade, I went on a trip to London, and all I could think about before I went was the possibility that I might be able to offer someone a jelly baby myself. I was, in short, a Tom Baker girl, and I think it goes without saying, a total nerd. I grew up, and Doctor Who went away, but then he came back (as The Doctor will do), and suddenly, everyone’s a Doctor Who fan. I have friends who dress as Daleks for Halloween. Someone I know painted a door in her house to look like the Tardis. Somebody in my state already has a TARDIS vanity plate. I’m a little mad* that I didn’t think of it first, but mostly, I’m thrilled to live in an era in which such wanton nerdiness is socially acceptable. But you never forget your first Doctor, and you surely never forget his scarf. 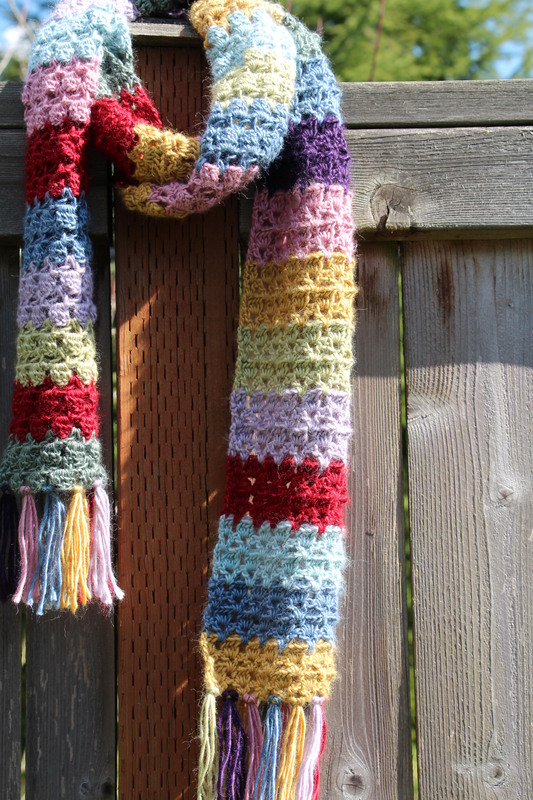 Although I was thrilled to discover that someone has dedicated an entire website to the Fifth Doctor’s scarf, complete with knitting patterns, I wanted something a bit more feminine. I ran across this scarf by artist Julia Crossland, on Pinterest, and I lusted for it. I know how to crochet – quite well as it happens – so that wasn’t a problem. The problem was this: it uses nine different colors of yarn that is, well, expensive. I fondled the yarn once at a shop in Seattle, then looked at the price, and gave up on the idea of making the scarf the way she did. It would cost me nearly $150 in yarn to make it using the Debbie Bliss Andes yarn she used. The first and most obvious solution to the problem was, of course, use a different, less expensive yarn. I considered that, but in the end, purchasing all those colors in some other yarn adds up quickly – and I wouldn’t have the same exquisitely soft, shimmery scarf at the end. I debated other solutions, too, but in the end, discarded them all and simply worked on other projects. And then, just before Christmas, a sale email from an online yarn store arrived, and guess what was on sale? I ordered one skein of every color. Merry Christmas to me. The pattern was easy enough to do; it uses the Sultan Stitch which is found in Betty Barnden’s Crochet Stitch Bible . The book is available on Google books. I love the soft colors and texture of the scarf, the feminine loops and scallops, and the romantic sheen and halo of the yarn. Crossland describes working with Andes as “like working with warm air,” and I think that’s about right. It just floats, like fine satin through your fingers. I finished the crocheting several months ago, but for some reason couldn’t decide how I wanted to do the fringe until last week. But then, it seems fitting to unveil my girly version of Doctor Who’s amazing stripey scarf today – the 50th anniversary of the show. Happy Time Traveling, one and all. *okay, a lot mad. Bitter, even. 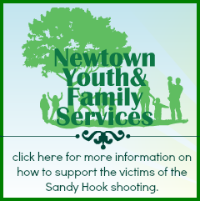 If you’re on Twitter, please look for hashtag #BloggersforSandyHook. As a child, I loved Alice in Wonderland. My mom had an antique copy of the book with a loose binding and color pictures printed occasionally on shiny paper. I used to read it endlessly. In college, though, I really came to appreciate Alice. My Freshman English class decided to chuck the “official” book, a long-winded memoir by an anthropologist, and instead voted to read Alice in Wonderland. Because school – even college – should be enjoyable. Fun, even. During the class discussion of Alice, another student pinpointed Alice’s magic: She wasn’t a whiner like Dorothy. Although he stated it rather cynically, he nailed it. Alice didn’t spend her time wishing she was somewhere else: She chased a rabbit into an unexpected world, and once she got there, she kept exploring and discovering, all the time asking curious questions. It was an adventure, and she embraced it. Alice epitomized childhood innocence. We were all reminded this past week how quickly childhood innocence disappears; I wanted to preserve a bit of it in remembering those who perished at Sandy Hook Elementary. I thought back to Alice in Wonderland and by chance was able to find my old college copy of the book – battered and yellow and perfect for upcycling. I used it to make Christmas ornaments. An old book, or magazine, or catalog. An ball-shaped ornament. I used clear plastic ones from Ben Franklin, but you could also cover an old ornament. Very fine glitter. I used a champagne color because it works well with the yellowed pages. Put something down on the table, you’re going to make a big mess. Tear the pages you want to use out of the book. Trim away excess margin and white spaces, as shown above, then tear the pages into strips (so that you can read sentences). 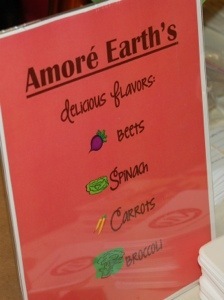 I liked the torn-edge effect, but if you prefer, you could use scissors or a paper cutter. Remove the metal tops from the plastic balls. Paint the modge podge on the back of the strips. Let it sit a few seconds; the paper gets softer and easier to work with. Starting from the top, lay the strips down on the ball, covering all the plastic and slightly overlapping the pieces. Smooth out any lumps or bumps, adding extra modge podge to the top if you need to soften the paper. There’s no real science to this, just as long as the look of it pleases you. Once the entire ball is covered with paper strips, turn it upside down and let it dry for a bit. Coat the entire ball with a generous layer of modge podge, and using a shaker top, shake a thin layer of glitter over that. Turn the ball back upside down and let it dry completely (overnight). Dip the metal caps into the modge podge, and then dip into a bowl of the same glitter. You want a thick coat of glitter here so don’t be shy. When everything is dry, put the metal caps on the balls, and hang on your tree. You can also add little tags to the top using twine or ribbon, perhaps identifying the book or simply with a holiday greeting. The finished balls are more glittery than they appear in the picture. One final thought: Today is the 24th anniversary of the Lockerbie bombing, in which 270 innocent men, women, and children lost their lives. One of them was my dear friend Rachel, age 21. I miss her every day, but especially today. I wish you all a safe and peaceful holiday. Thank you for visiting. My father flies up a few days before the arbitration. It’s my birthday, but I don’t really feel like doing anything; all I really want is a divorce and something resembling a reasonable agreement, and they don’t sell those online. We decide to tackle some home improvement projects, like fixing the garage door, which hasn’t opened since six months ago when the spring broke. It was an expensive repair that I didn’t want to make if I had to sell the house – I’d rather The Departed have to bear his share of the cost since he was clearly determined to have his share of the profits. My father haggles the price down but it’s still quite a bit of money – basically, it’s now my birthday present. I can put my car in the garage. Not only that, I can take it out again. It makes me incredibly nervous, having spent this money on the house – I feel like we’ve now jinxed Monday’s proceedings, counting on a victory that is not yet mine. My father apologizes for the superstitiousness he’s sure is genetic, and informs me we’re moving on to other projects: We’re going to paint a room. Which one? I decide on The Child’s bedroom, for the simple reason that it’s in the worst shape – it must be painted regardless of whether we move. 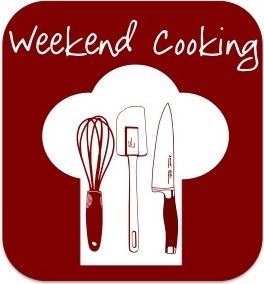 By Sunday, though, I’m able to persuade him we need to do something fun, and as it happens, the Northwest Chocolate Expo is going on that day. We’re going. I’m the only one of the three of us who is excited about this. We’re getting my birthday treats there, I tell them. I never got any cake. I want chocolate. Plus, I can take it with me when I move … if only on my hips. 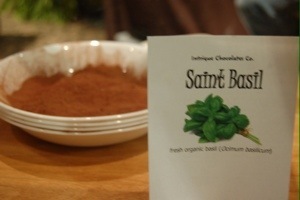 My first stop was at the Intrigue Chocolate Company booth, where I sampled their extraordinary Basil Chocolate: – rich chocolate with a refreshing basil undertone that sneaks up on you and hits you just as the chocolate stops melting. There’s a reason the dish in the picture is empty – it disappeared fast. 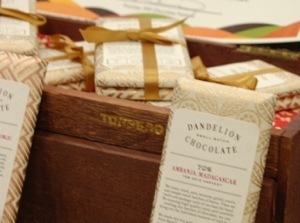 San Francisco-based Dandelion Chocolate came to Seattle for the event, and offered samples of their extraordinary Madagascar 70% bars. I don’t even know where to begin with this chocolate: the citrus undertones packed quite a wallop, yet the overall flavor was smooth and not too strong the way dark chocolate can sometimes be. It was a bar to be savored slowly, and probably would pair well with wine. Forte Chocolate, from Mount Vernon, WA, had a wonderful selection of unusual chocolates, including one with the addition of some nice, biting chili pepper, that I enjoyed much more than I thought I would. I also adored their white chocolate bars. I wish I could remember more about the booth that had this *cough* healthful assortment of chocolate offerings. 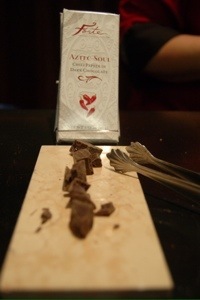 I did try the beet chocolate and it was nice, in an offbeat, I’m trying too hard to be cool kind of way. 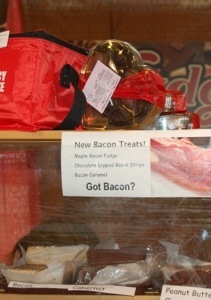 I didn’t go there with the Maple Bacon Fudge or Bacon Caramel, though. The exhibitors at the Festival were all super-friendly, and why shouldn’t they be? They get to hang around chocolate all day … for a living. The Festival got a bit crowded, but it was still fun – even for the child, who brought home a box of Carter’s Chocolates Obama Salted Caramels to show all her friends. 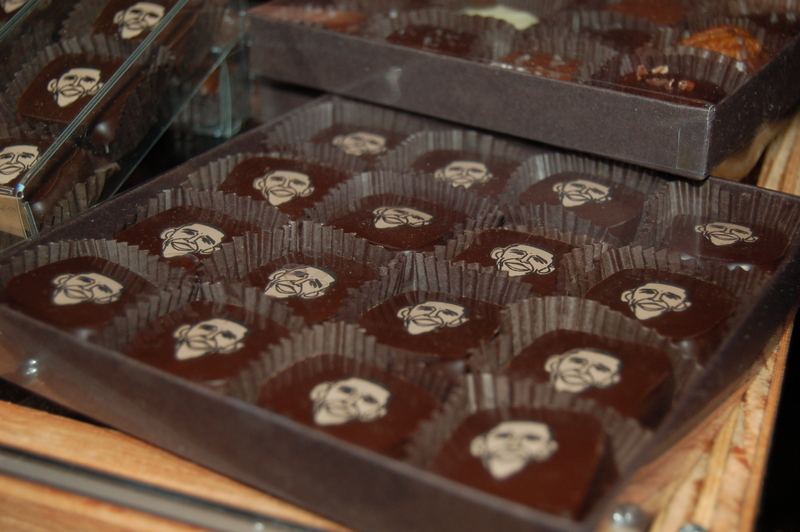 No, there were no Romney chocolates available that we could find. And yes, they were delicious.